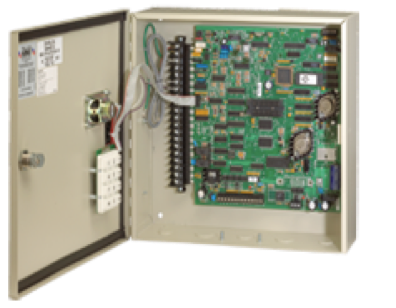 Multi-door access controller ideal for small businesses, office buildings, factories, industrial sites, apartment complexes, or for any application that requires access control and reporting capabilities. A 2-door controller that easily expands to control up to 16 doors. This flexible system allows access control by means of encoded cards, five digit PINs (Personal Identification Number), wireless RF control, or with almost any 26-bit weigand devices. Remote account manager and transaction analysis software included. Live Streaming. Live Transactions. Built-in programming keypad. Interfaces with 2 card readers – up to 16 with tracker expansion board(s). Anti-pass back. 8000 event transaction buffer. 31 Security (permission) levels. Database import/export capability. Built-in clock/calendar. Holiday schedule. Hold open/entry code time zones. Postal lock input.